Enough time. Is that really a thing? It’s like a unicorn, or a Loch Ness monster, or a toddler that doesn’t scream. We’ve all heard of it, but has anyone actually seen it, achieved it? We all have busy lives. And that’s a fact that isn’t going to change. So what do we do when we have so many things on our plate that we inevitably end up neglecting something? Well, we could stress out or complain about the lack of time, but is that going to help?  Being flexible and adapting to the situation (whatever it may be) helps to eliminate some of the stress of time management issues. 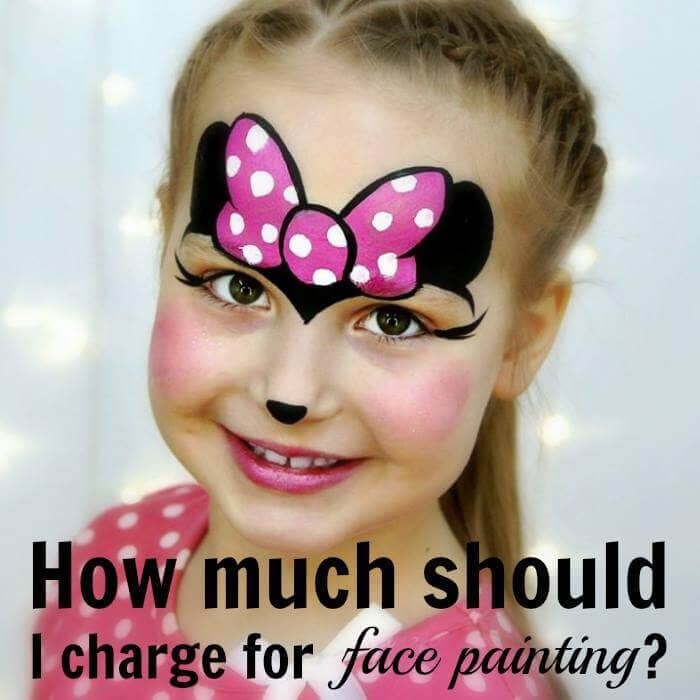 Many of us have children, and quite a few have full or part-time jobs outside of face painting as well. And then we have to meet those annoying basic human needs. We need time to eat, sleep, shower, exercise, take a walk, brush our hair… at least once in a few days. 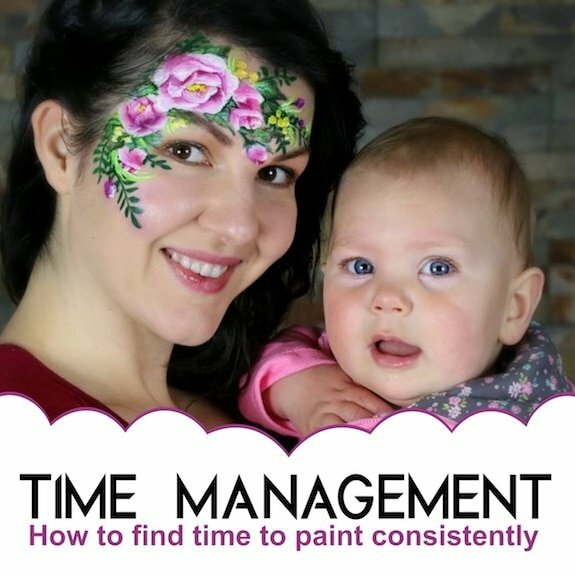  How can we find time for painting in that hectic schedule? We are writing this post because we are still looking for a solution ourselves! We want to share with you the ideas that we have gathered so far, from our own experiences and those of our fellow classmates at the School. There are some very organized and clever students here that have come up with some very creative time management and painting practices to fit into even the craziest schedule. This post is all about keys for keeping yourself engaged in the creative process. 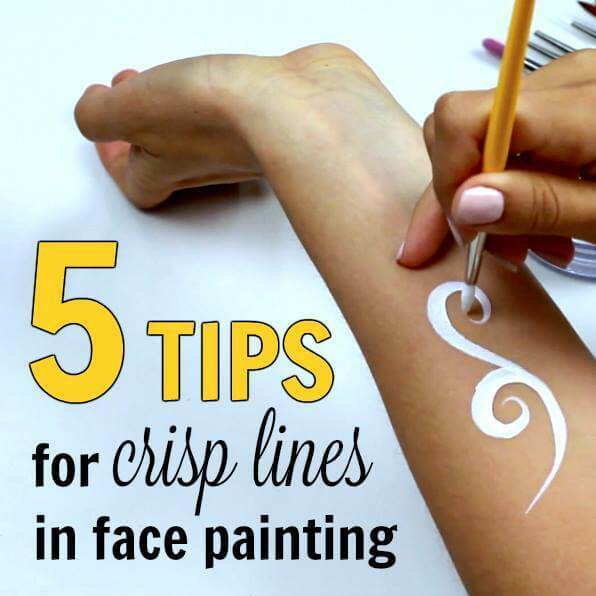 In other words — how to find time to paint consistently. At the end of the day, even with all of the tools of organization available to you… it’s ultimately up to you to implement a time to paint or, as a student of the School, study! In this article, we prepared main tips that help us stay organized and on task. 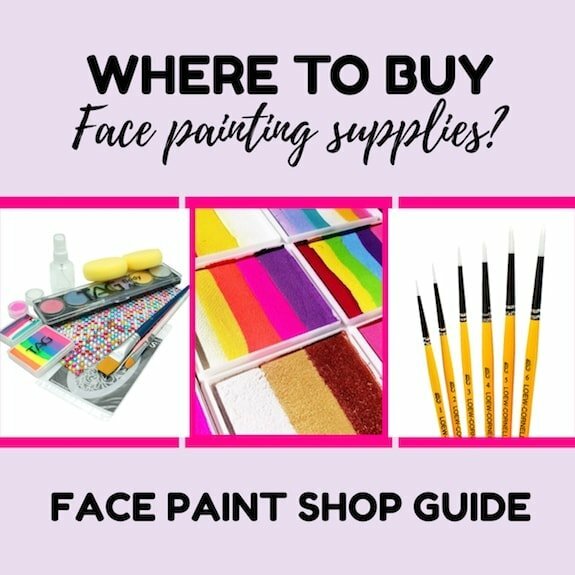 Making a daily checklist can be quite helpful and is important for mastering how to become a professional face painter. Writing down even routine activities we need to complete can help us stay on task even during a busy day. Once again, flexibility is key. Don’t stress out if you can’t complete every task, in order. This defeats the purpose of the list being a helpful tool. Simply do your best to complete the tasks you absolutely need to complete, try finishing the most important tasks first. Prioritize your list as much as possible. This will help you remember to complete your list, but allow you to focus on the more important tasks first. I am a person who always liked to make to-do lists first thing in the morning and would cross things off as I completed them. It just makes me feel more accomplished seeing it all crossed off. I even go so far as to write silly things down like “take a shower” and “do makeup”…LOL they are tasks after all! 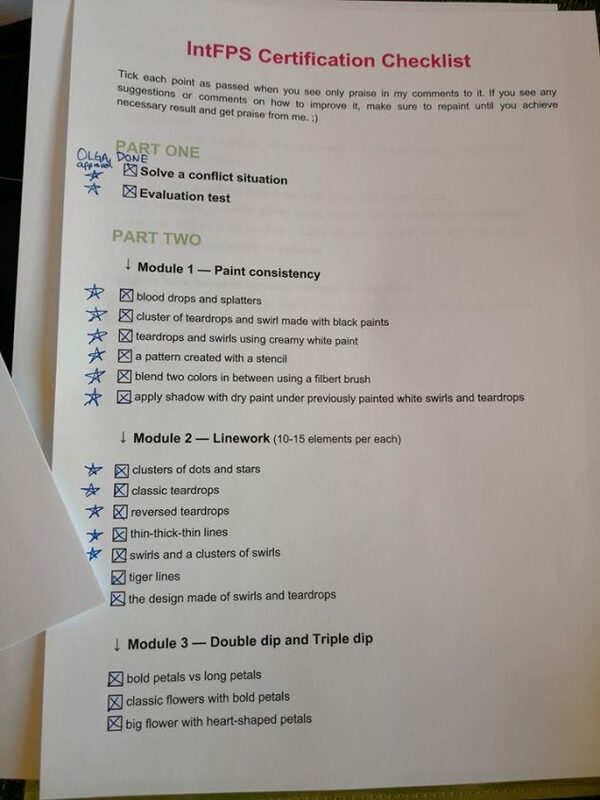 International Face Painting School Certification Checklist that helps our students stay organized and productive along the training. Many of us find it difficult to paint, not only due to time constraints but because many of our working kits have gotten so large that we hate unpacking and then packing back up when practice is done. Not necessarily because it is too time-consuming, but the procedure of unpacking, washing, putting things back during an already busy day can prevent anyone from even trying. 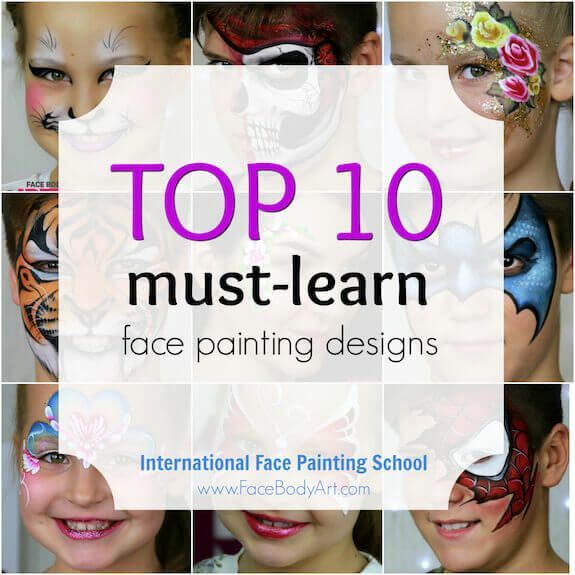 Mini-kit of International Face Painting School instructor Kristin Olsson. School instructor, Kristin Olsson, utilizes the mini kit to eliminate this stress. 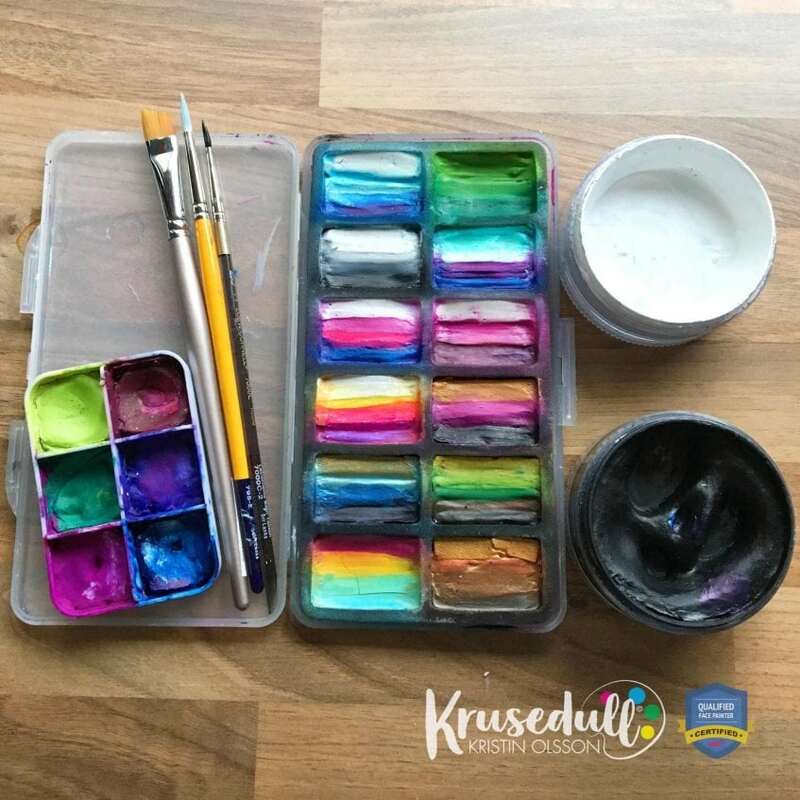 A mini kit can be as simple as a 6 color palette and a couple brushes, or you can utilize several colors and split cakes with a larger number of brushes and even glitters. Pack into it what you use most often, but keep it simple and sweet or you’ll defeat the purpose. Mini-kits by International Face Painting School students. These mini-kits make practice far less daunting even on the smallest time allotment. They will also allow you to take it with you in the event that you find yourself sitting bored, waiting for someone for an extended period of time, such as waiting for kids to get out of practice or school… or perhaps you are traveling! You can purchase pre-made kits, or get creative and make your own! 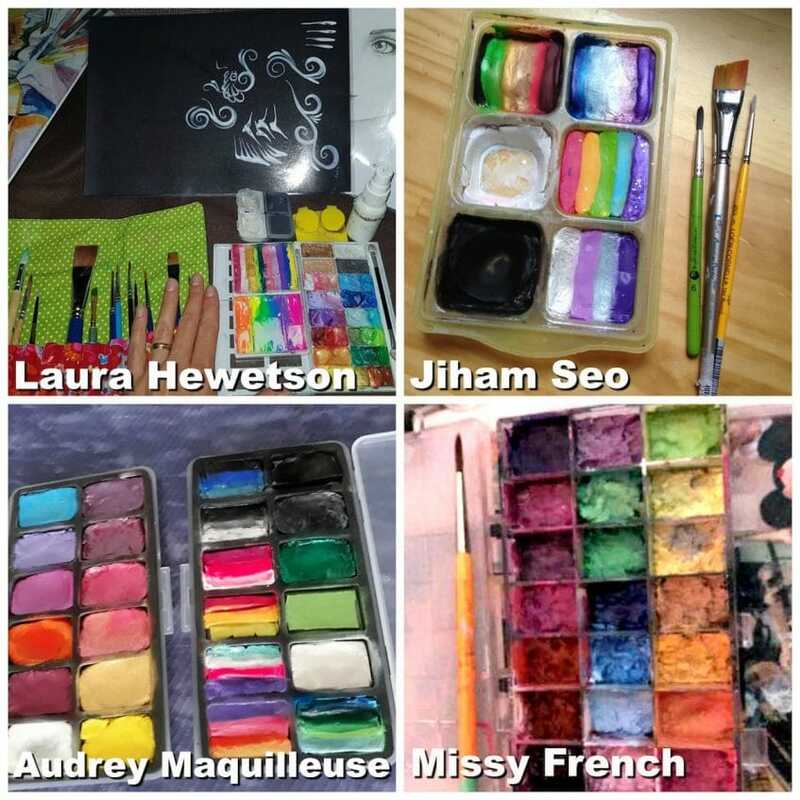 Student Jiham Seo has a new baby, and smartly recycles baby food containers into palettes for her DIY mini kit! Many of us find employing a daily schedule is the key to keeping organized. Especially in the case where you are blessed enough to be able to work from home, this method can be vastly important! Working from home sounds (and is) amazing, but it’s extremely easy to find yourself so busy with your household duties that you don’t actually get to do any work. Kids and sometimes spouses can easily forget or not fully understand the importance of your work time. Setting a schedule for it can help you and your family respect that time. 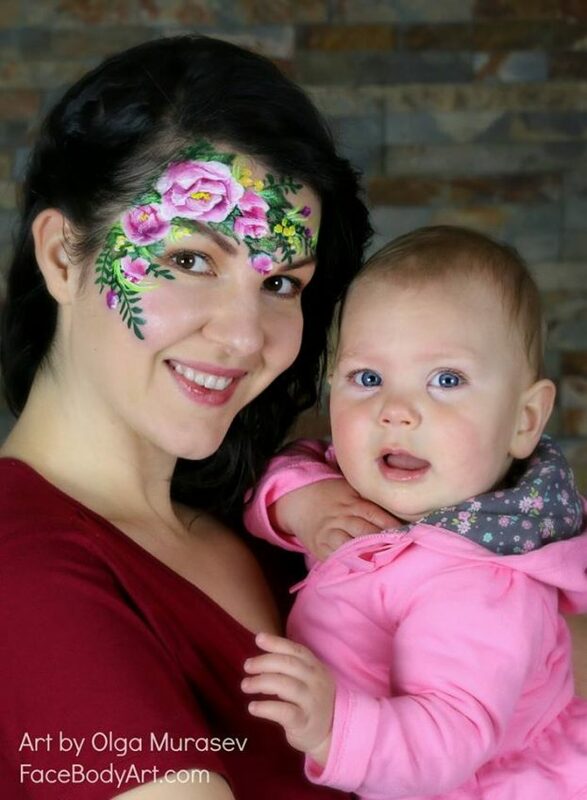 Olga Murasev, the founder of the International Face Painting School paints during her baby’s nap times or when granny takes her for a walk. I know, I know… easier said than done. 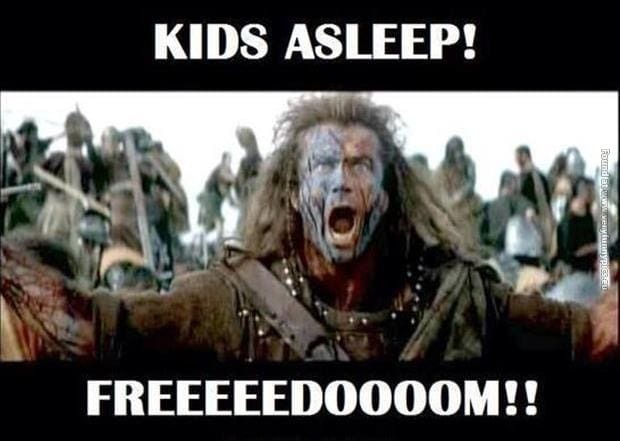 But, utilizing nap times, school times, ballet lessons, or even brewing a pot of coffee and staying up a little past the kids… any such time where your family is distracted or otherwise occupied can help! Or, designate that time for your family to work on quiet projects at the same time so you can all enjoy the time together. Student Jiham Seo shows just what can be accomplished with organization and determination in your heart! 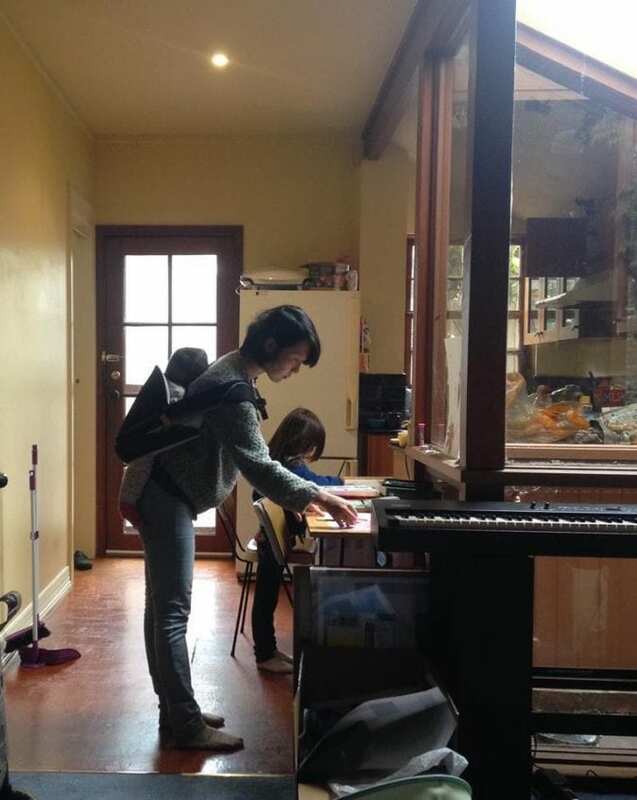 Wearing her infant as he sleeps, painting in her designated area as her young daughter works on a project next to her. 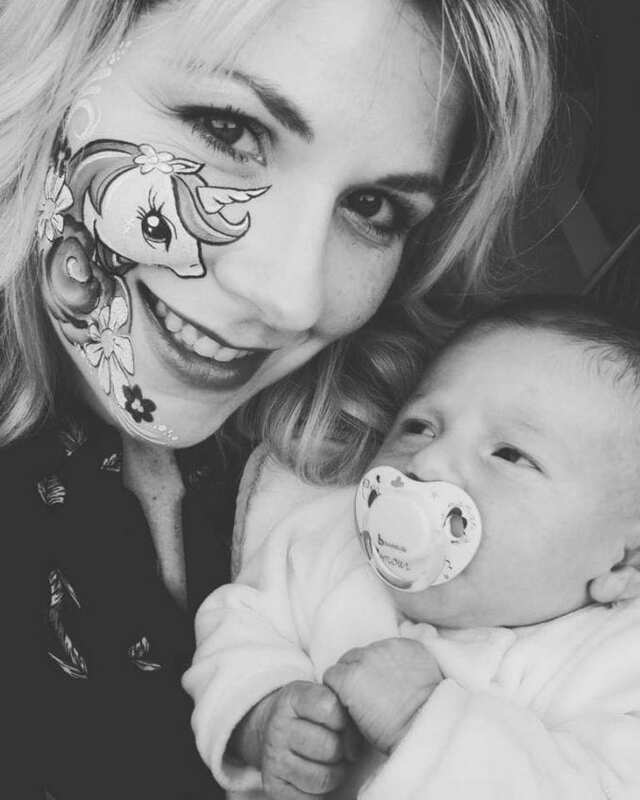 New mom, School graduate and future School Instructor Elodie Bisegna Ternois admits that she hasn’t completely figured out how to care for her new baby, herself and continue in her business. But, she stated that she often utilizes little Molly’s frequent naps and paints with her sleeping right next to her. Waking up, working out, having meals, going for a walk, going to sleep, spending time with our families — all at certain fixed hours is sometimes the key. Or perhaps you are taking your School checklist with you at gigs and practicing for 10-15 minutes at the end or beginning? How great would it be to have a space in your home where you can keep a selection of paints and tools (or your mini kit!) that you could keep set up for use any time? Whether you have a spare room, an empty corner, or maybe all you have is a couple feet of counter space! Setting up an area where you can work, practice and be creative could take you to the next level in your creative process. You can make this fit into your lifestyle, it just takes a little creativity. Be sure to explain to your family the importance of this space so it doesn’t also become a catch-all or you end up in a situation where you catch your little one all up in your paints! 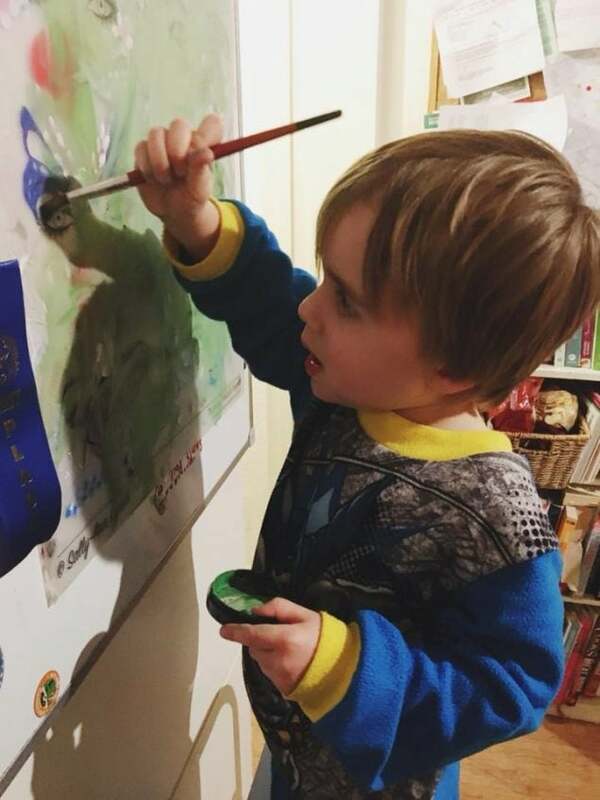 Student Tanya Renner even sets up an area where her little one can paint on her training board with face paint remnants when she’s not using it. A quick wipe down and rinse and it’s good to go for her next practice. 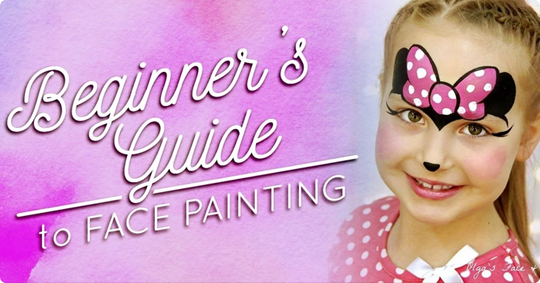 When you have your paints and tools all ready to go, even a quick 10-minute practice can make all the difference. And when you aren’t having to spend 15 minutes seeing up and packing away your kit, it can make all the difference in the world. Daily practice shows in the quality and speed of your work. 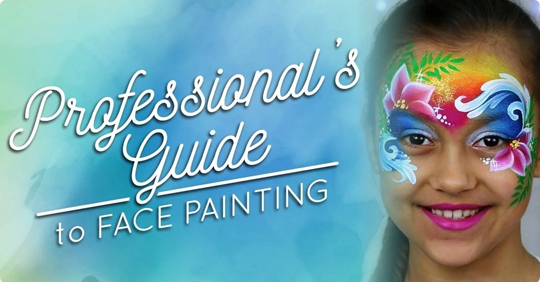 Painting your own face isn’t always practical, comfortable or even possible for some artists. The difficulty for me started when I needed models to practice on. I can’t see much without my glasses and my skin is not as tight as I would like it to be . 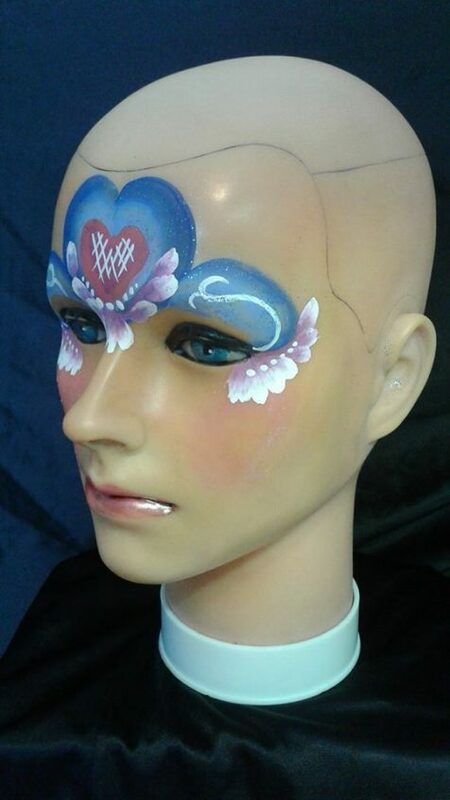 So being my own model was only possible with a few of the designs… I painted every design on a model or on myself. I think it is important to practice on skin, because it is so different than a practice board. But, that meant that I had to ‘rent’ some models too. Practice boards can be a great tool for practicing even when you don’t have a model on hand. You can take them anywhere and try out designs as often as you’d like. While convenient, it’s important to note that painting on skin and practice boards are 2 completely different things. Be sure to try out designs that have been practiced in boards on real skin to test layout and texture. 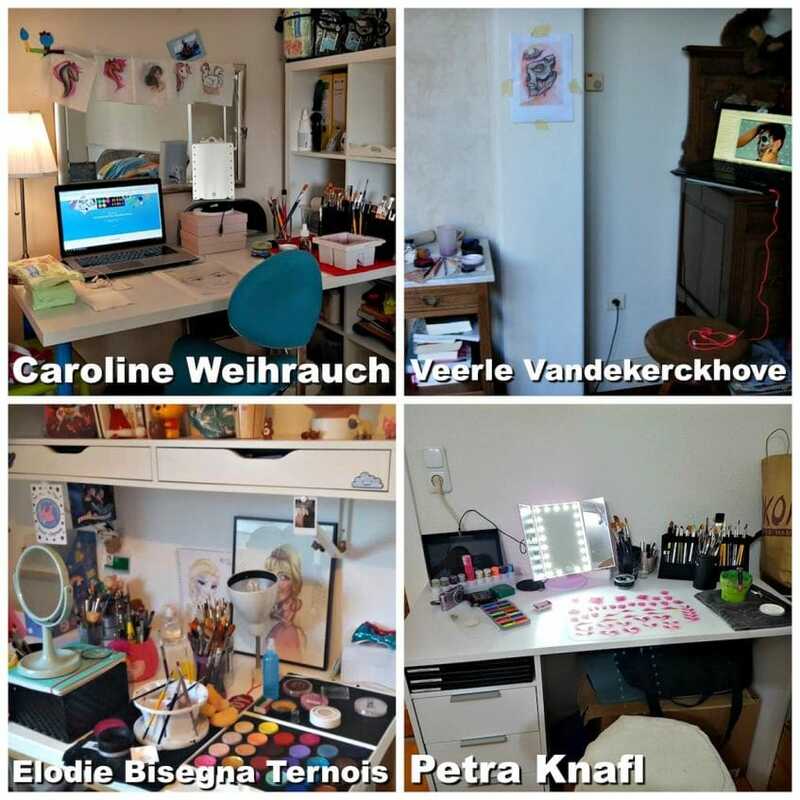 Graduate Veerle Vandekerckhove shares her clever way to practice a design. 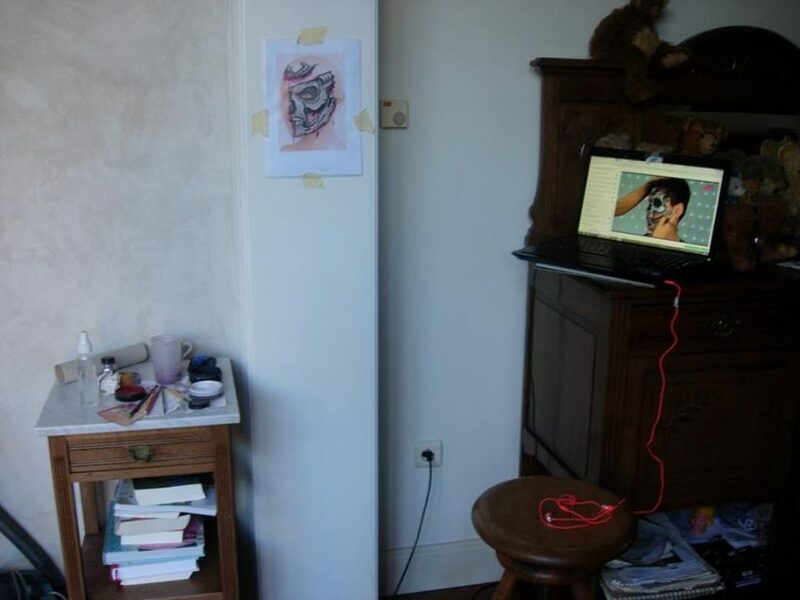 She is using a plastic folder with a photocopy of a head in it, that is then attached to the wall, simulating the verticality of painting on a person. Her laptop with the video from the IntFPS online course going on and on. There are several options for purchasing practice boards if you’d like to go that route. Sally Ann Lynch, Jest Paint and Sarah Janackovic offer great professional boards. We even have several budget-savvy students who have printed our model diagrams and inserted them into clear folders to use as homemade boards! Where there’s a will, there’s a way. 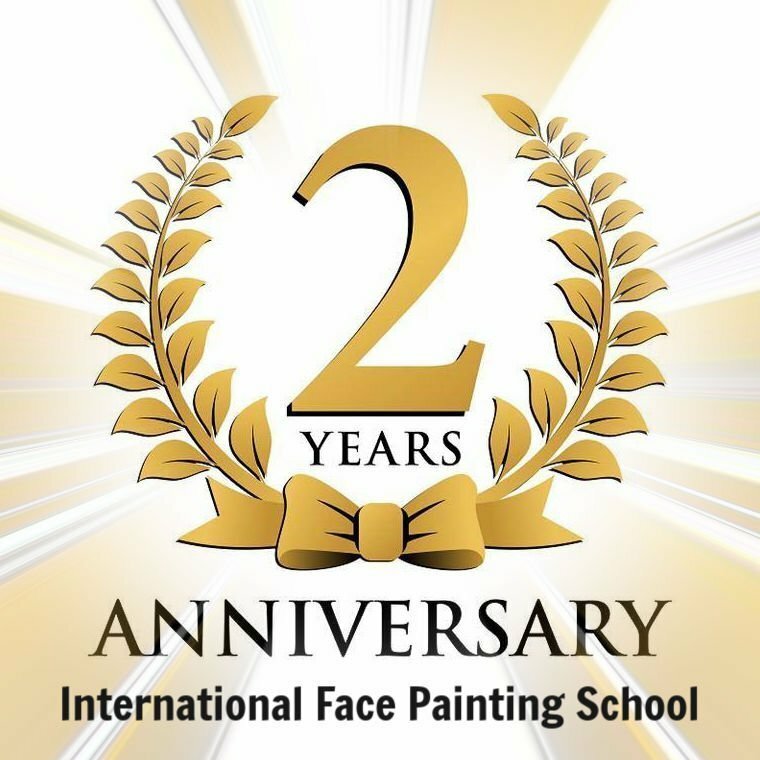 Tip: International Face Painting School students benefit from an exclusive 20% discount for Sally Ann Lynch Training, Tried and Tested boards, as well as many more exclusive discounts from the best face painting suppliers. For a more realistic practice surface, many artists find using a practice head to be a much better option. While not as inexpensive as practice boards, investing in a head will definitely up your game. The head allows you to implement focal points and layout of your designs, so you know how your art will lay on a child’s face. This tool can make all the difference in the world and can be purchased at any of the recommended shops online. Practice head and design by student Dottie Kast. You may want to check out Dottie’s inspiring story and progress in our “Achieving Greatness: How the School is paving a pathway to success blog post“. And for an even cheaper option for the “starving artist”, use… your thighs!  No, really! Put on some shorts and paint them legs! Some of us will have a bigger surface area than others, but in this case, bigger is definitely better! School student Laura Hewetson finds her thighs a perfect practice canvas while submitting her homework! Your legs, arms, your child’s legs… You will find in the School lessons, that Olga often even uses her model’s back to show larger designs or just multiple variations and practice steps. I have a fancy notebook for sketches that even has a pen that is attached with an elastic. 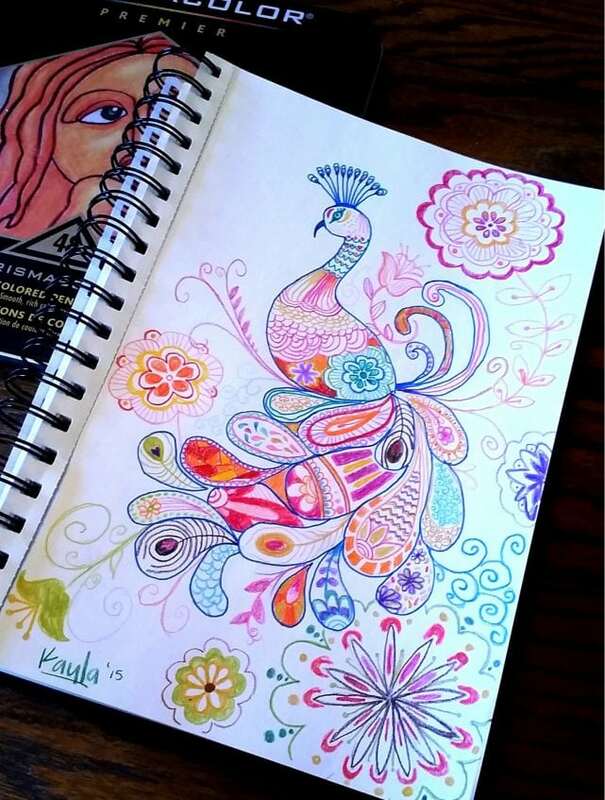 It makes quick sketches of ideas that pop into my head much easier to remember! Then when I have the chance, I try it out with paint. While this isn’t going to look exactly in pen as it will in paint, it’s a good way to keep an idea from completely leaving your brain. Image for reference by unknown artist. At the end of the day, there will always be distractions, appointments, and life! But if you can find a technique, or maybe even implement a few of these, to help you become more efficient in your studies, your skills, and even your work… this will make all the difference in the world. Five minutes may not seem like much, but those five minutes can be a full face at a PPF gig that can score you an extra $15 (or whatever you may charge). Those minutes add up quickly, and as artists, the more we can utilize those minutes, the more effective we can be in every area of our lives.